Sometimes, I am slightly more normal than others. (Albeit, rarely.) 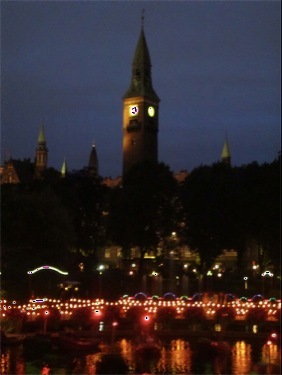 One of these times came on my evening in Copenhagen when I ventured to Tivoli, a 150+ year old amusement park. Now granted my reasoning for visiting was probably different than many people’s, but I enjoyed it greatly. When I was little, I read a book called Lotte’s Locket. I read it about 10 times or so, but all I remember is that Lotte got lost in Copenhagen and she and her class went to Tivoli. 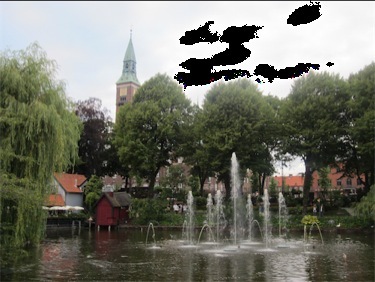 So when I was going to Copenhagen, Tivoli was at the top of my list. I went for about 3 hours, including part of the Friday Night Rock Concert and dinner. I will say that while the screaming people on rides is one thing, the atmosphere at Tivoli at night is something different altogether. The lights combined with the concert are very special. Tivoli is an amusement park, but not like Six Flags or a place like that. You pay for admission and rides separately and it’s quite possible that you’ll only pay for one ride, not a ride pass. 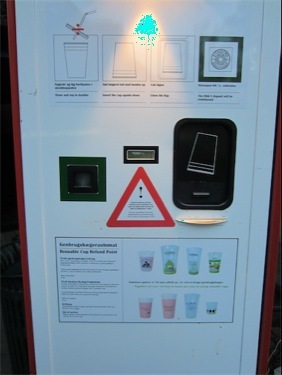 First, Tivoli loves recycling. If you recycle your plastic drink cup, you get a small refund.Very cool. There’s a lot of cool looking gates and stuff. 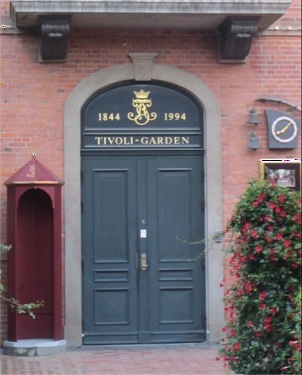 This door makes me think the most of “Tivoli Garden” the way I thought of it in the past. Then there’s the Arabic looking castle. With cool fountains and roses…of course. 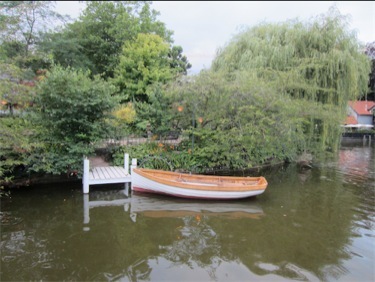 And amidst the rides and the chaos, there is a row boat on a lake. The lake also has fountains. The steeple you see in the background is from the City Hall. Copenhagen (like many European cities) is very good at preserving trees. Go Green! 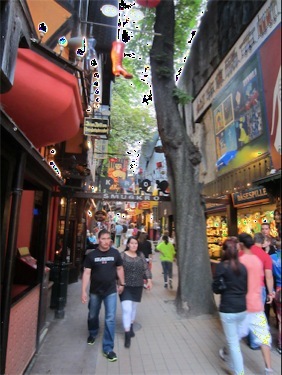 This stretch of Tivoli made me think of Harry Potter and Diagon Alley. Anyone else see a resemblance? 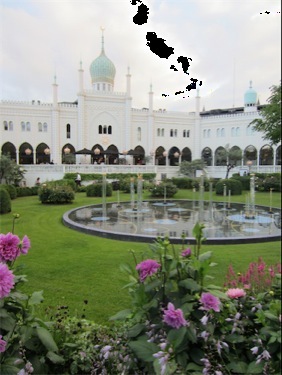 Anyone know if J.K. Rowling had been to Tivoli before writing the Harry Potter books? 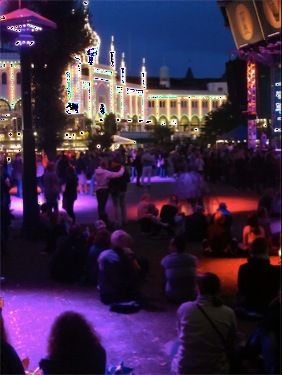 The open space area in front of the stage lit up for the concert. The palace is lit up in the background. 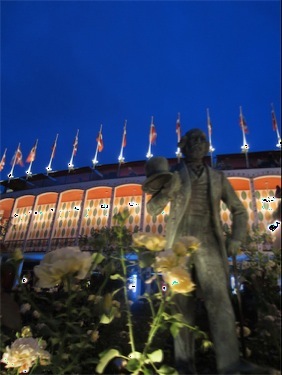 Norwegian flags and a statue…and roses. The City Hall and the lake. At night. One of the craziest roller coasters, all lit up, with screaming people aboard. 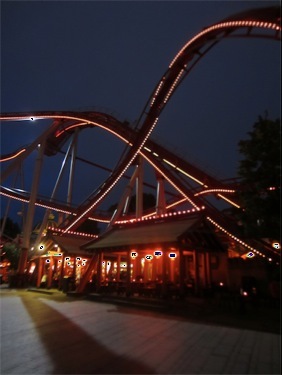 I would go back to Tivoli in an instant. Preferably with some friends so that I have people to hang out with and go on rides with, Obviously I should go back to Copenhagen soon. 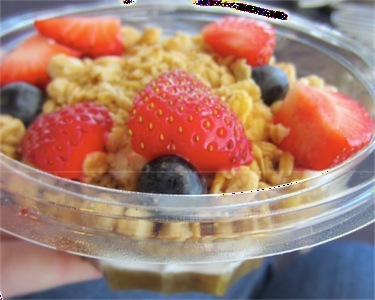 One of my big foci for travel is food. 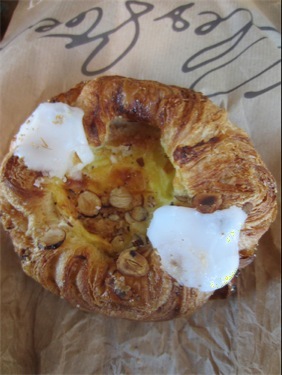 I think I started planning my Copenhagen eating 2 months in advance. (For a 24 hour trip.) 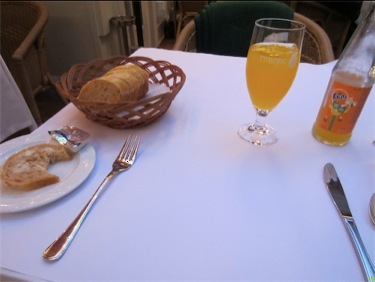 While I am often not willing to pay money for souvenirs or museums, I am almost always willing to pay money for good food. Actually, amusingly, absolutely none of my plans panned out, but I was thrilled with my decisions. 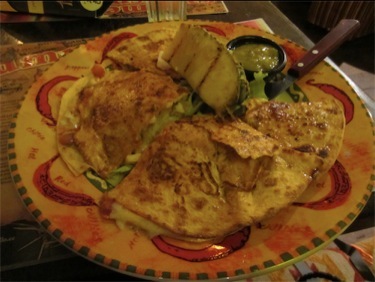 The only food I think I haven’t been happy with on this trip was the night when I got cheap Tex-Mex in Estonia. Lesson learned. Grilled pineapple and chicken “quesadilla” with cheese sauce and yogurt-esque guacamole. But to give you an idea of how I eat while traveling, I’ve decided to share my last 24 hours (relative to when I’m writing) of food with you. Figuratively. I’ve been super geeky and taken pictures of everything I’ve eaten, so this should be pretty easy. Some kind of lamb Smørbrød on rye bread. 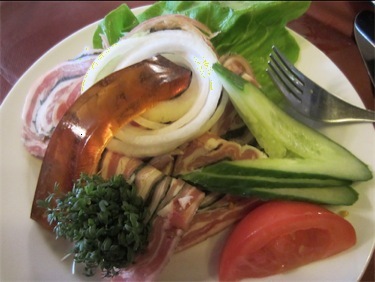 (with cress, aspic?, onion, tomato, cucumber, and lettuce). 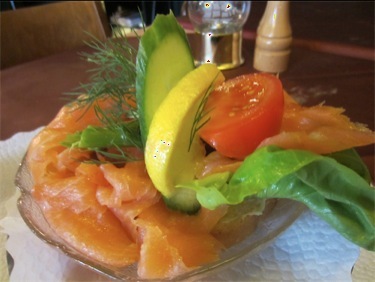 This lunch made me want to only eat smoked salmon smørbrød for the rest of my life. It was pretty spectacular. Sadly the lamb came out second and that was ehh, in comparison. BUT WOW. SMOKED SALMON SMØRBRØD I HEART YOU. 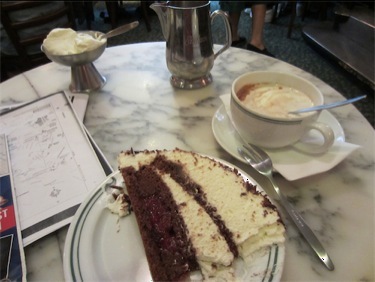 Hot chocolate (literally) with whipped cream and a variation on sachertorte. The chocolate was amazing. Actually better without the cream than with…AND it came with two glasses worth in the pitcher. Sadly, the cake was super boozy. Like the whipped cream was probably not cream but booze. Is it possible that you can create whipped cream out of 100% booze? But the cherries and chocolate in the cake made me happy. And it was purdy. Fanta and a cheesy, spicy, salty, red pepper bread with Lurpak butter. Gazpacho with chopped onions and green peppers and cream cheese? 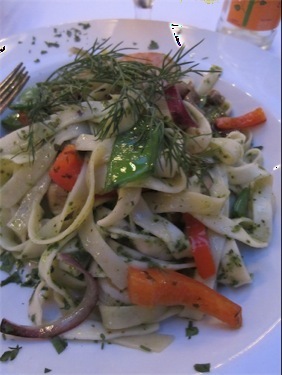 Tagliatelle with shrimp, red pepper, onions, peas, and dill. 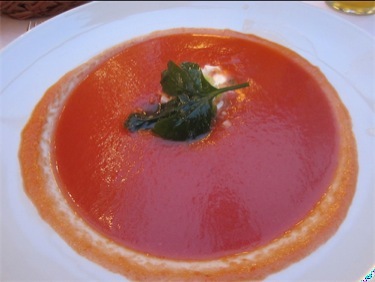 I ordered the “Summer Menu” because I wanted the tagliatelle, but I was not really that excited about the gazpacho. That said, the whole dinner was fantastic. Fan-freaking-tastic. And I got vegetables which I’d been short on since/in Germany. This place is my new favortest bakery ever. My computer tells me that favortest is not a word, but I know it is, because this place is my favortest. First off, I worried that at 8am on a Saturday morning, they might be busy. I waited, maybe 3 minutes to be served? Second of all, they make delicious goodies. 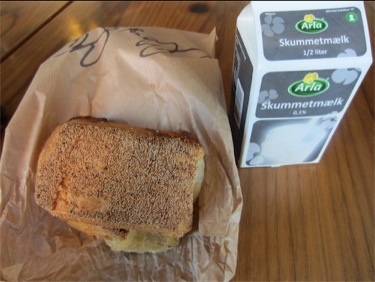 Bread, sandwiches, pastries, yogurty-goodness. All delicious. If they opened a franchise in Minneapolis, I would buy from it all the time. i would probably go broke. Come to think of it, that is a very bad idea. I think I’d been to London 3 or 4 times before I went to the British Museum. I’ve been to New York at least three times and have never been up the Statue of Liberty or to the Met. I visited Seattle twice in the past six months, but in my life I’ve never been up the Space Needle. This is a part of the equation: what did I not do. To be honest though, I usually don’t worry much about this. If the city is worthy, I will return and finish out the list I created of things I want to do. I also am pretty good with prioritization, so the things I was dying to do get done. 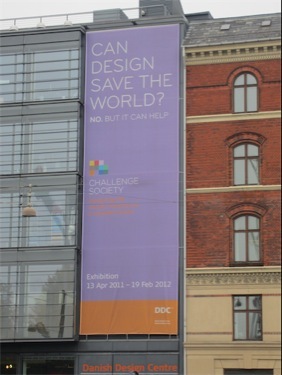 There was also an exhibit of the history of Danish design – ranging from chairs and shoes to hearing aids and colostomy bags. To me, this museum was pretty much the coolest thing ever. It was basically a museum of my field. Katie’s Dad:Agriculture Museum::Katie:DDC. I had no clue that this existed. And I’m not patient enough with tourist brochures to sit and read everything before I go, so I wander, as I said earlier. And sometimes…there are amazing things that come about.